What can we say about the “Preaching Moment”? What is “The Word of God”? Preaching is a theologically significant moment in the life of the church. It is a moment in which God’s revealed will is spoken out, and brought to bear on His people. It is also the moment in which outsiders are included in an intimate encounter between a people and their God, part of which is a clarion call to them, to respond and be reconciled. But despite lofty rhetoric about God speaking through the preacher, it can clearly be shown that when the Bible is preached, it’s the preacher who speaks. God is a speaking God, who created the heavens and the earth in speech-acts, and who has been speaking throughout history since. God speaks today, just as Jesus promised, through the Holy Spirit, to his people. But the very scandal of the entire Biblical narrative is that God would work His redemption plan through the agency of such fallible, fickle, stiff-necked creatures as humanity. Indeed, even to begin to explain how it could be so requires the entire narrative, beginning in Eden, reaching a crescendo in the Advent, and continuing through subsequent history right to The Last Day and beyond. “What is man that God has considered him” (Psalm 8:4)? Much, apparently, in every way. God has ordained that when the Bible is preached, it’s the preacher who speaks. The moment when God’s word is preached is a precious moment in the life of the Church. It is the time at which the people are brought close to God’s story of Creation, Redemption, Salvation, and Restoration. It is the moment in which a heart may be moved to respond to the call of God. It is the moment at which the otherwise franticly busy people of God pause, and are still, and are receptive to hearing the things of God. In the preaching moment, God’s word is ministered to his people. At least, this is what ought to happen, when “the Bible is preached”. To preach what the Bible says is not necessarily to preach what Jesus preached. Chapman says, “If what I preach is not, in fact, what the Bible is saying, then it is obvious that the hearers will not hear the word of God”, but Gomes points out that often the Bible is talking about Jesus, and, “it is easier to talk about him than it is to talk about what he talked about”. Jesus preached, “the word of God” (Luke 8:11), not stories about himself. In the modern church it is customary, or at least quite acceptable, to refer to the Bible as “the word of God”. This term is used extensively throughout the Bible, but one thing that it absolutely cannot mean in those contexts is “The Bible”; the Bible had not yet been compiled. In one sense, depending on our view on the nature of divine inspiration, the whole Bible could be claimed as “something God has said”, and in that sense it is not invalid to label it “the word of God”, but for our purposes it will be useful to retain a distinction between “preaching the Bible”, and “ministering the word of God”, as something mentioned in the Bible. “The word of God” also does not strictly mean, “The Scriptures” of old, as Chapman suggests. To be fair, Jesus did employ the term “the word of God”, to mean “the Law of Moses” (Matthew 15:6, Mark 7:13), but even so, the Law of Moses is something God had said (Exodus 19-23), before it was written down, as Jeremiah points out, in “this command I gave them, ‘Obey my voice, and I will be your God…’” (Jeremiah 7:22-23). Because when “the word of God” is used within the Biblical narrative, it generally means something God has said in the past. When Samuel shared “the word of God” with Saul, he was talking about God’s recent revelation about Saul (1 Samuel 9:15-27). This usage more precisely accounts for the aorist “ἐλάλησεν”, of Hebrews 1:1-2, than the tortured present-tense interpretation Chapman attempts. Strangely, Chapman cites the occasion of Jesus’ reference to the burning bush (Matt 22:31), and concludes that it is because it was written down that Jesus says, “what God said to you”, when quite clearly, God said it! What about when “the word of God is ministered”? Is it then “God himself who speaks”? In the New Testament the “word of God” had a role in Creation (Hebrews 11:3; 2 Peter 3:5), is associated with “the powers of the age to come” (Hebrews 6:5), and is instrumental in the New Birth (1 Peter 1:23). Indeed, Jesus Christ is himself the “word of God” (John 1:1; 1:14). But even preaching about Jesus may not necessarily be ministering the word of God. Granted, Jesus is the centre of the worldview of God (Romans 11:36). He is monarch of “the kingdom of heaven” (1 Corinthians 15:24-25), the King of Glory (Psalm 24:7-10), but this same Jesus is also the preacher from Galilee (Matthew 13:55-56), who had a fascinating life, performed miracles, taught about justice, and coined countless pithy sayings. To proclaim the preacher of Galilee is to preach the Bible. To proclaim him as King of Glory, is to minister the word of God, because that is the message of the Bible. But it is important that Jesus said, “Whoever has seen me has seen the Father” (John 14:9), because this reveals Jesus’ ministry: for three years he was imparting a message through his actions and relationships, and the sum of all of that experience was an accurate representation of “the Father” (cf. Hebrews 1:3). This is the depth of the sense in which even the “word of God” points to something else: to God. But God Himself is no mere object of contemplation either! Jesus was not trying to have Philip merely sit down and think about how lovely God is. Jesus was reconciling the people of the world with the global plans and horizons of God. To “see the Father”, is to get hold of the Grand Narrative of God’s world-view. It includes a conception of history (Acts 7:2-53), of the present (Hebrews 3:7-8), and of the future (Revelation 21-22). It is a way of thinking, and a radically different way of perceiving the human experience (2 Corinthians 5:7). So then, to minister the word of God is to impart this world-view. But in what sense could we say that “it’s God himself who speaks”, at that moment? The epistles presuppose that the “word of God” has been shared already with the readers (1 Corinthians 15:1-2), and are generally not an attempt, in themselves, to share it. They provide only references to it (1 Corinthians 15:3-8; 1 Timothy 3:16). A preacher can preach all the way through these passages without necessarily ministering the word of God. In the case of Ephesians 3:6, for example, to “preach the Bible”, one must talk about Jews and Gentiles, whereas to “minister the word” is to proclaim our portion in Christ. In either case, it remains the preacher who speaks. Chapman makes much of the fact that the preacher is the “ambassador” (2 Corinthians 5:20), rightly equating this to a “mouthpiece”, saying that we speak on God’s behalf. But this being the case, it would be logical to conclude that it is the preacher’s voice being heard, not God’s. The very term, “ἀπόστολος” (“apostle”) means, “one who is sent”, and in Biblical terms, sent by God (Romans 1:1). One scarcely needs to send an ambassador if one intends to do the speaking. The only person in the book of Acts who was reputed to have spoken with the “voice of a god” was Herod (Acts 12:22). Indeed, in contrast to that episode, when Cornelius worshipped Peter, he was rebuked with, “stand up; I am only a mortal” (Acts 10:26). Granted, Jesus told his disciples that when they are being accused, “it is not you who speak, but the Spirit of your Father speaking through you” (Matthew 10:20), but this is not a reference to “preaching the Bible”; it is a reference to persecution and martyrdom. There is even a Biblical expression, referring to “the voice of God”, and “my voice”, and related terms. but this is not suggesting that God is speaking when the Bible is preached. The expression refers to things that God is reputed to have said in the past, particularly through his prophets. Jeremiah uses the expression more than any other author, and in many cases he makes it plain that he is referring directly or indirectly to Exodus 19:5 (eg. Jeremiah 7:23; 11:7). In Jeremiah 42, the “voice of the Lord”, is what “I [Jeremiah] have told you today” (42:21), but even then, the message itself is related to the original Exodus one by the references to Egypt. In this way Jeremiah is actually appropriating the “my voice” motif from Exodus 19:5, even though it is a fresh warning (Jeremiah 42:19). Even here, Jeremiah is repeating what God said to him, and God is not actually speaking in the preaching moment. At best, God has just finished speaking. The statement, “When the Bible is preached, it’s God himself who speaks”, is arguably backwards. It might rather be said, “God himself has spoken, and so the Bible is preached”. Jesus ministered the word of God, notably in parables, but because it can be said that in any event, when Jesus speaks, “it’s God himself who speaks”, we cannot use his preaching as our prototype. But Hebrews appears to be “a sermon or homily”, and therefore possibly represents an example of ministering the word of God. Hebrews 1:1-2 recalls that God spoke “to our ancestors in many and various ways by the prophets”, and even, “in these last days he has spoken to us by a Son”. But it makes no claim that God is the speaker while the message is being given. Even the expressions in Hebrews 3:15 and 4:7, and including the original force in Psalm 95:7-8, do not describe a new utterance of God “today”, but a new obedience “today”, to what God previously said. This is not to say that God is no longer speaking! He certainly is, despite Chapman’s apparently cessationist view. God speaks to the believer (John 16:13-16), and if that believer is a preacher, then what God has said might well be preached. But if it were true that, “When the Bible is preached, it’s God himself who speaks”, it would scarcely matter what the preacher said, because God would overrule it. Alternatively if the preacher lied, so then God would be lying, which cannot be (Hebrews 6:18). So then, perhaps retreating from the difficult, verbal, plenary understanding of, “… it’s God himself who speaks”, Robinson refers instead to the various phenomena of the preaching-moment experience: “God himself spoke through the personality and message of a preacher to confront men and women and bring them to Himself”, but despite it being a lofty thought he can offer no Biblical support for it. He cites 1 Thessalonians 2:13, but that describes the word of God as having been “heard from us”, Paul’s ministry team, not “heard from God”. The most that we can say about God’s voice in the preaching moment is that when the Bible is preached, it’s the Church that speaks, and this is the Church which is the body of Christ (1 Corinthians 12:27), of which Christ is head (Ephesians 4:15). Recalling the precedent of describing persecution of the church as persecution of Christ himself (Acts 9:4), we could venture to say that, in a vicarious manner, “Christ himself speaks”. But this is overdrawing a metaphor. It is the preacher who speaks. The authority to preach has actually been delegated to the church (Matthew 28:18-20), and it has pleased God teach his ministers to preach (1 Corinthians 2:13), and to employ them (1 Timothy 1:12), and to give them to the church (Ephesians 4:11), in order to build it up into the unity that God has intended (Ephesians 4:12-13), and to send them to other hearers also (Romans 10:14-15; 1 Corinthians 1:17), because what God has already said is sufficient (Luke 16:31). The preacher is to speak out the same, previously divinely given Gospel message, throughout the ages, in the solemn and confident hope that it returns a bounty for God. Far more awesome and terrifying than the thought that, “it’s God himself who speaks”, is the realisation that the preacher, personally, has been found worthy to preach (1 Timothy 1:12). The preacher is given a message which, by the world’s standards, is “foolishness” (1 Corinthians 1:21-24), and is commissioned to preach it consistently, irrespective of the reception it gets (2 Timothy 4:2-5). God will ultimately burn away what has been preached in error (1 Corinthians 3:13), but the preacher is responsible for their work (v 15). Indeed, those who presume to teach will be judged with all the more exactness (James 3:1). The preacher is bought for a price (1 Corinthians 6:20; 7:23). 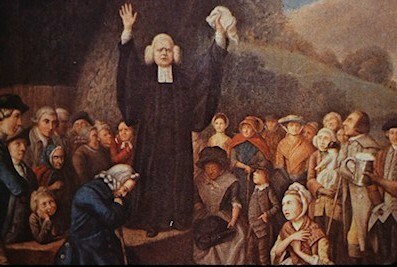 The preacher’s prayer ought not to be, “God, may it be you who preaches”, but rather, “here am I, send me” (Isaiah 6:8). Not, “speak to them for me”, but rather, “within me there is something like a burning fire shut up in my bones; I am weary of holding it in, indeed I cannot” (Jeremiah 20:9). The preacher is the one who must say, “thus saith the Lord”, in the face of any and all opposition to the message, and so whatever else the preacher prays before preaching, the closing thought ought to be, “… so help me God. Amen”. Because when the Bible is preached, it’s the preacher who speaks. Carson, D. A. New Bible Commentary. 4th ed. Leicester: Inter-Varsity Press, 1994. Chapman, John. Setting Hearts on Fire : A Guide to Giving Evangelistic Talks. NSW, Australia: Matthias Media, 1999. Gomes, Peter J. The Scandalous Gospel of Jesus : What’s So Good About the Good News? New York: HarperOne, 2008. Robinson, Haddon W. Biblical Preaching : The Development and Delivery of Expository Messages. Grand Rapids, Mich.: Baker Academic, 2001. John Chapman, Setting Hearts on Fire : A Guide to Giving Evangelistic Talks (NSW, Australia: Matthias Media, 1999), 23. Peter J. Gomes, The Scandalous Gospel of Jesus : What’s So Good About the Good News? (New York: HarperOne, 2008), 18. D. A. Carson, New Bible Commentary, 4th ed. (Leicester: Inter-Varsity Press, 1994), 1321. Haddon W. Robinson, Biblical Preaching : The Development and Delivery of Expository Messages (Grand Rapids, Mich.: Baker Academic, 2001), 19-20.